Intelligent Health, a company committed to improving the health of the nation by getting people physically active, asked Sunny Bird PR to raise awareness and generate participation for the launch of its latest programme in the South West. The eight-week Beat the Street programme encourages people to get outside and get active in their local area by placing Beat Boxes in green spaces. Players, often children and families, tap the boxes using special fobs and key cards to gain points, with leading scorers winning prizes. In an age of busy schedules, smart phones and Pokémon Go the Sunny Bird PR team faced an uphill battle encouraging both parents and youngsters alike to put down their phones and get outside. The team faced an additional challenge of getting the broadcast and national press interested in such a regionally focused initiative. 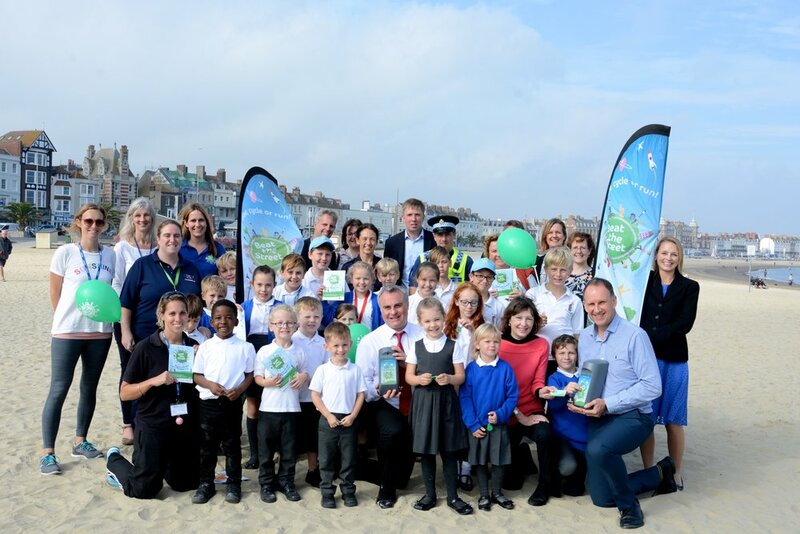 To ensure news of the game was spread far and wide, Sunny Bird PR invited key regional print and broadcast journalists along to a launch event at Weymouth beach. Journalists at the event were invited to meet the games’ founder Dr William Bird MBE and the CEO of Sport England, which granted the game £3.3million National Lottery funding. Journalists had the chance to hear how the game worked and ask questions to discover what it would mean for their own regions. Afterwards, we invited journalists on to the picturesque beach to meet with local school children who were chosen to test run the game making for media-friendly photo opportunities. By inviting press along to meet key stakeholders and try the game out for themselves, we secured a sought-after feature on BBC Spotlight as well as two radio interviews. News of the launch, and the Sport England funding, was pitched to regional and national titles resulting in 14 published articles including Healthy Magazine (90,055) and Leisure Opportunities (23,000). Encouraging participation throughout the game was paramount to its success. To do this SBPR organised two community events aimed at the games’ core audience; school children and the often socially-isolated older generation. The first of these was a ‘Spooky Tales’ Halloween event held in the school holidays. We invited children in the area to dress up, listen to stories and gain double Beat Box points for attending. The Sunny Bird PR team managed to secure popular children’s TV presenter Chris Jarvis for the event who kept the children entertained with stories and games. We advertised the event on social media and in the regional media booking out all 60 places in just two weeks. The second event, ‘Wellbeing Walkies’, was focused around how getting outdoors can help encourage a sense of community and mental well-being. We devised a community dog walk along the ‘Beat Box’ route and encouraged residents to come out for a morning of dog walking and talking as well as the chance to collect more crucial Beat the Street points. To give the event an extra draw, we partnered with much-loved local charity Margaret Green Animal Rescue with volunteers joining us for the walk and collecting donations on-route. Through these two events we secured eight articles in regional press which reached almost 150,000 readers and served to generate interest at the game’s mid-way point. To gain national exposure for a regional initiative, we knew we would need a powerful and emotive story to pitch to press. Throughout the game, we kept our ears to the ground for heart-warming stories we thought may interest journalists. We spoke with Helen, a mother whose experience with Beat the Street changed her life for the better. Helen explained how the game helped her adopted son Max manage his Foetal Alcohol Syndrome Disorder and better channel his energy. We listened to Helen’s story and from that compiled a feature and supporting assets. We approached national women’s titles with the ‘inspirational mother’ story and used news hooks such as the Health Minster promoting preventative medicine. This activity secured two features in Healthy Diet (92,400) and Chat Magazine (203,014), both due to be published later this year. Through a carefully considered PR strategy and a mix of features and events, Sunny Bird PR was able to secure 30 pieces of coverage in just three short months- ten pieces each month! Securing coverage in broadcast, radio and print meant we were able to reach over 2.3 million people with news of Beat the Street. If the same space was bought in advertising, this would have cost £26,378.